The iPad version of MM3D is available now! CLICK HERE to hit the App Store and get yours. 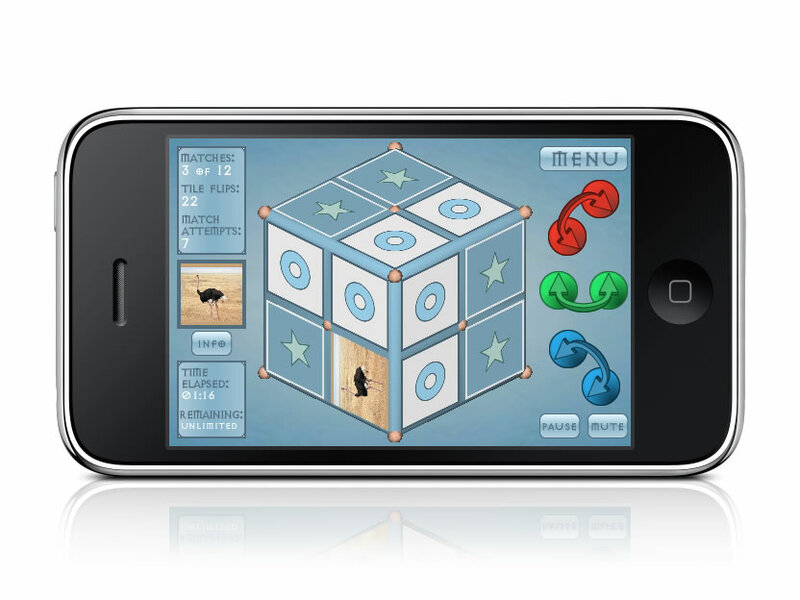 Mix Match 3D for your iPad, iPhone or iPod touch is a challenging and original turn on the classic memory match game where you search for matching images on a 3D game cube. Set a time to beat and briskly turn your game cube until you've matched all images. Pause when you want a break and stop the countdown. Or go with no time limit and take leisurely turns through all the images, touching the Info button to learn a little about each of the images you're seeking. Got all your matches in record time? Enter your name in your local Best Times list and get bragging rights. Turn on the game music for soothing background sounds or turn the game music off and listen to your favorite iPod tunes to inspire you. Choose your favorite interface color; green, blue or red. How fast can you clear your cube?